Apollo is journeyman vocalist Apollo Papathanasio. 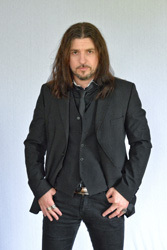 Involved in music since a young teenager, fronting many bands over the years, you probably best know him for singing for Time Requiem, Firewind, and most recently Spiritual Beggars. Writing and recording over the last several years, Apollo thought first of introducing his music via a new band. But friends persuaded him otherwise; he should go solo. Apollo arrives with his first solo album, Waterdevils. To start, there's a few things we don't know about this album. Most significantly did Apollo have any help writing and arranging these songs and who played on the album besides him. The credits are in short supply. But what we do know is the good stuff. As a vocalist and a songwriter Mr Papathanasio is in fine form. Having a slight raw edge to his voice, Apollo sounds strong singing melodic and clean. More importantly, the music seems molded and twisted to match his timbre, perhaps more than with his more recent bands. But having said all these fine things of Apollo as a vocalist, he may actually be surpassed by the songs and music themselves. Upstaged as it were. The Apollo style is essentially melodic hard rock with a definite metal edge, yet still wrapped in AOR accessibility. Melody, harmony, and groove are abundant from the riffs and chords to vocal arrangements, from catchy refrains to the ripping solos. There is some significant and energetic shredding across this album. On to a few song highlights, again with the music taking some precedence. Within Fallen Endlessly, something of subtle anthem, the drumming is superb, especially in the outro following the guitar solo. For some spirited rock and groove Rise Up and Liberate Yourself churn with energy and enthusiasm. For some of that metal edge, notably in the riffage and driving rhythm section look to the heavier and brisk Revolution For The Brave and Chasing Shadows. Curiously, there's nothing akin to a ballad here. The softest thing maybe the aforementioned Falling Endlessly. 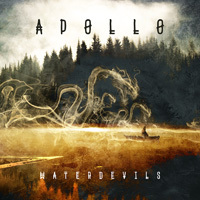 For a first solo effort, Waterdevils, Apollo Papathanasio has delivered a powerful and entertaining album of AOR melodic hard rock with a metal edge, music that suits his voice and speaks to his long career in those genres. Easily recommended.